Who is the Basic On-Leash Program for? The Basic On-Leash Program is for people with dogs that are 7 months or older. This program is for dogs that are exhibiting all the normal behavioral and obedience issues of the typical family dog (butnot for dogs dealing with aggression issues – there is a separate program for that) . 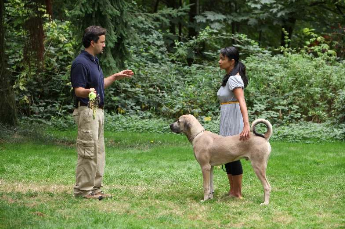 The Basic On-Leash Program focuses on teaching you to train your dog in functional obedience. The ultimate result of that is long term, permanent solutions. The aim of this program is that you don’t need to go to training classes for years. We teach you the underlying principles for “why” we’re asking What Clients are saying Sean is an amazing trainer. I had been to five other trainers. Odie was still jumping, getting overly excited … not listening and mouthing me hard! I didn’t like it. Odie is a you to do, or not do, certain things, so you have more confidence and understanding in your new training ability. Do you train with food treats? As a rule, we don’t use food as a primary training tool for dogs over 7 months old. I was originally trained in food-based, clicker training and operant conditioning. However, I found over the years that relying solely on food treats wasn’t very functional for most dogs in real-life situations. In other words, food centered training worked (sometimes) as long as a dog was really hungry, or as long as there wasn’t anything else around that was more important than the food treat. I found that tapping into a social, leadership relationship with a dog is a more functional way to create long termchange in real life. The Basic On-Leash Program is 7 private lessons, at your location. The lessons take place over about 5weeks. Every ‘in person’ client in the Basic On-Leash Program gets a copy of The Dog’s Way DVD Training Course (over 10 hours of video lessons) as a reference tool, so you can watch and re-watch any lesson, at your convenience, to solidify your learning. In each private lesson, you’ll get specific homework assignments to do with your dog. You’ll also learn Buddy is amazing now!! We thought there was something wrong with him? We were actually told he wasn’t very smart by a trainer we went to class with and now he’s the best trained dog how to adjust everyday interactions with your dog to foster a better leadership relationship with them and more easily coach them in your real world situations. Clients say that the program helps them to be very focused in the first few weeks, and the immersive experience helps them and their dogs to make the necessary shift to create long term results. Is the program different if your dog is younger (under 18 months) as compared to 2 or 3 years old or older? in order to follow one of the main principles that we always follow – the “natural learning process”. The “natural learning process” is starting everything as easy as you can and then incrementally adapting to progressive challenge (as opposed to trying to take big leaps in proficiency). The best human analogy I can give you for this process is a baby learning to walk. We follow a general 3 step process: first clarify the relationship, then work on core skills, and then set default rules or “policies” (rules that apply all the time without having to talk to your dog about itagain .. like jumping up on people, or jumping out of the car on their own, for example). Specifically, we cover the following commands and skills. How much does the Basic On-Leash Program cost? Can I take only a lesson or two? program is that my aim is to create long term results and often a lesson or two won’t do that. Sometimes though, particularly if you’ve trained with me before, and you just need to brush up on something, I will do one or two lessons with you. What if we don’t need all 7 lessons in the program (or maybe need an extra lesson)? How far out is your booking schedule right now? Typically from March through October, my schedule is two to three weeks out. November through February the schedule is one to two weeks out and we are closed for 3 weeks in December). I always like to let people know about this up front because frequently people will call and ask to start “tomorrow” … I apologize in advance for the inconvenience but I am usually not available on the schedule immediately.